My favorite toilet game, Solitaire for Android, on which I frequently play Klondike, was left in an unbeatable state yesterday, right at the very end of a hand. In case you haven’t already heard, Llamasoft has released Space Giraffe for PC. It’s US$20 for a license of the game, or you can download the demo here and give it a go. It’s pretty nifty, and the new NUXX version (no relation to nuxx.net) is a easier to see, for those who thought that the original version was too cluttered / busy. Don’t worry, though, the original graphics are still there as Acid-Mix should you wish to use them instead. 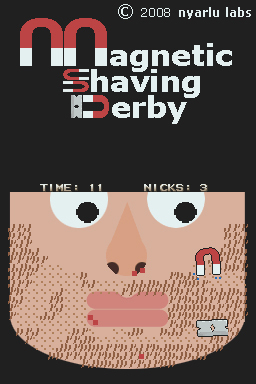 For those of you with an R4 or other method of playing homebrew on the DS, I strongly suggest you check out nyarla‘s in-development game Magnetic Shaving Derby. It is currently up to version 0.5, and here is a direct link to the zipped .nds file (mirror on nuxx.net). I think it could still use a bit of work, but it’s a really fun quick-play game. It would definitely be interesting if there was something like a bonus scrotum shaving round, a goatee / sideburn bonus, and maybe slightly different control of the magnet / blade, but as it stands it’s a pretty darn fun game. UPDATE: I’ve been told that there’s another version coming soon, so keep an eye on nyarla’s site for more info. In case you were wondering, yes, the Korg DS-10 Synthesizer for Nintendo DS is excellent. It’s awesome. Fun, very easy to understand, the works. I can’t wait until it’s released in the US so that I can have multiple copies running. The only thing I can’t figure out is what the SMT/HLD setting on the Kaos Pad is supposed to do. Oh, and it does seem like some of the settings (in particular those on the patch panel) don’t do anything until one slightly turns a knob, but that may be intentional. This sounds excellent on headphones. I can’t wait to see what people come up with using it. Hopefully there is a good way to trade songs beyond peered DS’.